In an astonishing turn of events, I actually get up at 3:30 in the morning and prepare for the trip down to the jetty, however catatonically I may do so. The power was actually on all night, and the internet at this time of night working like a charm, not that I would be missing this place. Leaving the hotel at 4:30 am, I am equally surprised to see the street crowded with vendors setting up their produce on mats on the pavement, some with battery-operated lights, probably costing as much as the goods they are attempting to sell. It doesn’t seem as if there is any prospective clientele at the moment, although who in their right mind would go shopping for food at this time of day. On the other hand, local eateries would need to buy food this early to have their foods prepared for the early morning. At the jetty, the ticket seller dispenses with my ticket efficiently, pointing at the lit boat below, the only challenge now descending the steep staircase towards the boat, and not tripping and hurtling unwittingly towards the water with my heavy packs strapped onto my tender body. I gingerly balance on the ramp leading to the boat, another opportunity for an early morning soaking, no gentlemanly figure present at this early hour to assist this delicate waif in boarding the boat. 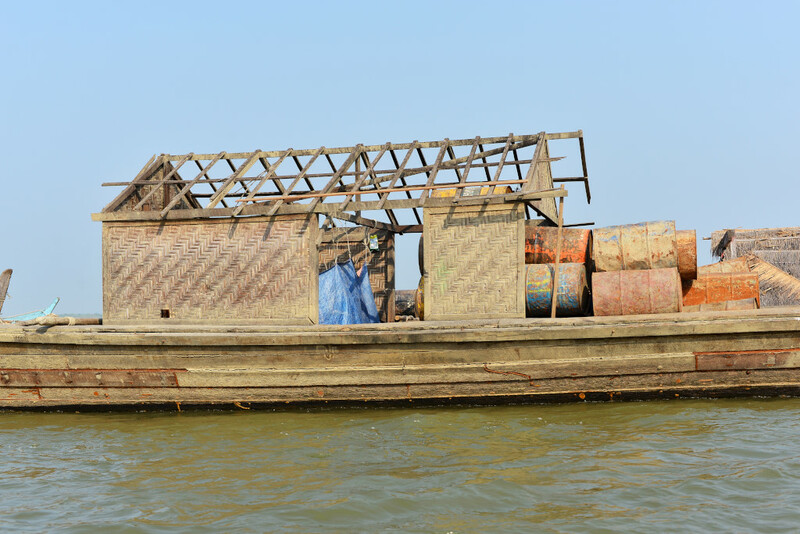 The boat is of the same girth as the boat that I came from Shwegu with, but there are few passengers on the boat at the moment, most huddled on the fore and aft platforms, wrapped in colourful synthetic blankets in a familial heap. 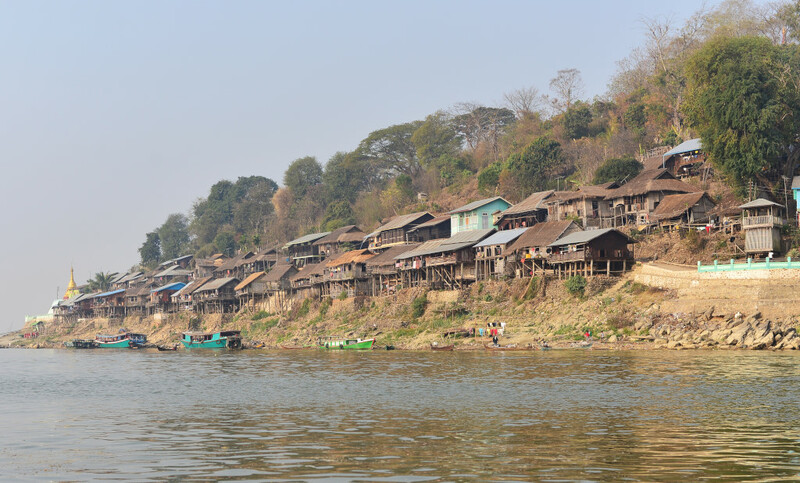 The handsome men, the beautiful women, the playful children high on the cute factor, faces uniformly painted with the face chalk the Burmese favor, the people somewhere between serene, aloof, and probably just tired. I settle into my seat, looking out in the darkness when the engines start and the boat begins moving. No, this is not right – the official departure time is 5 am, and it’s only 5:12 am. I was expecting the boat to actually not leave until it is loaded with people and merchandise, and it is virtually empty. The concept of this kind of vessel being punctual is somewhat shocking, but I am not about to stop the captain from piloting the boat mid stream. The boat gathers speed as we glide through the darkness, the light now dull grey, and dawn eventually approaching, the sun a sudden orange disk appearing above the shallow grassy banks, the tiny local thatch and bamboo encampments a dull taupe migrating to richer earth tones as the sun commences her daily journey into the heavens. 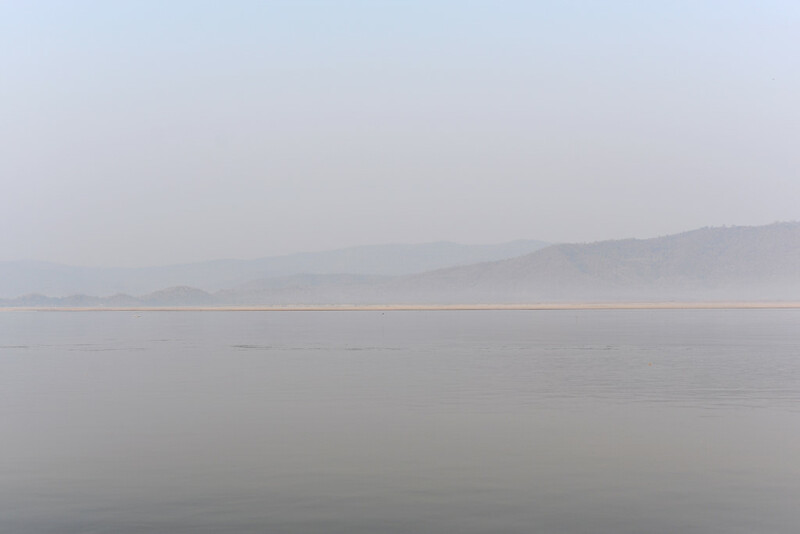 The landscape emerging from the mist at dawn is magical, the ancient banyan trees with their broad canopies a regal presence over the modest villages lining the river bank, the low mountains in the distance inscrutable, sheathed in grey. Lone boatmen navigate their canoes near the shoreline, although I curiously rarely seen anyone fishing on the river – and I doubt that would be due to concerns about pollution. 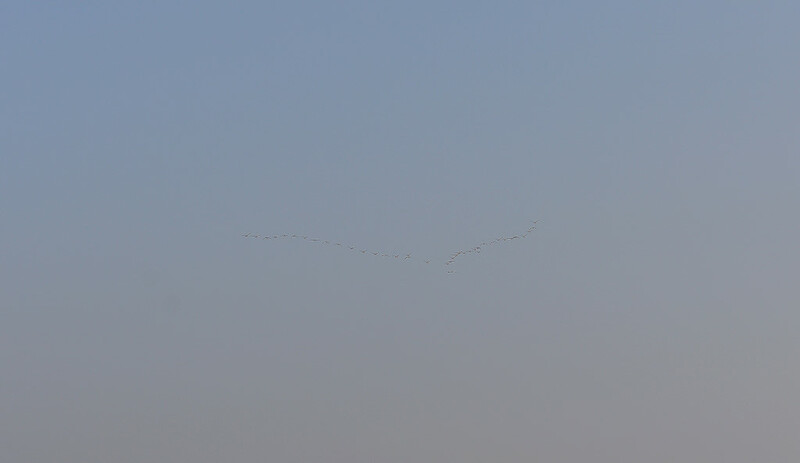 The broad empty palette before us is suddenly brushed over a gradual V-formation of geese flying across the horizon and disappearing in the distance. The shoreline is mostly flat, the drama of low mountains left largely behind us to the north. Grassy sandbanks mark the shoreline, extensive sandbars and mud flats vestiges of the low water levels this far into the dry season. 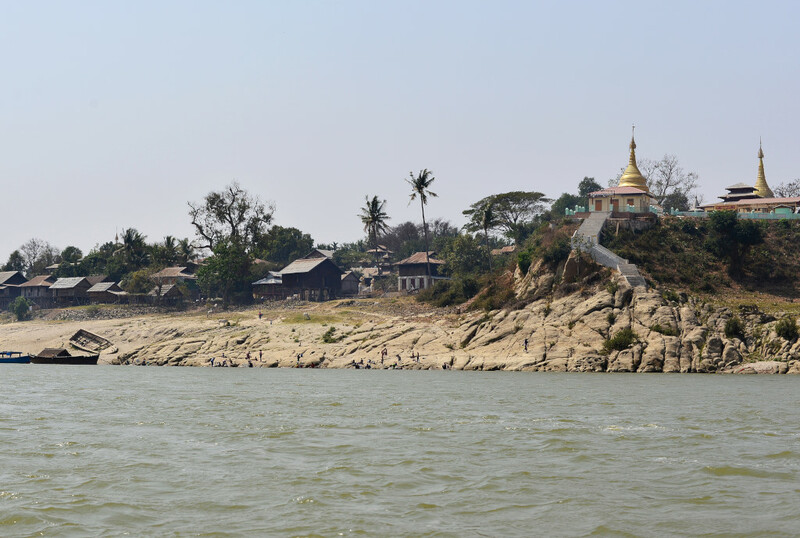 The parched shoreline is occasionally punctuated by small cream stupas, the Irrawaddy north of Mandalay hardly a place of any religious fervour. 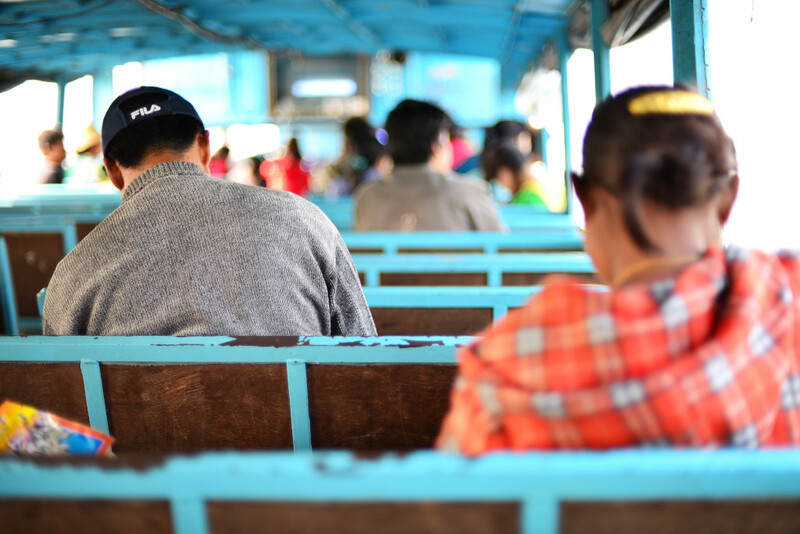 The passengers on the boat are largely immobilized, staring into the distance impassively. 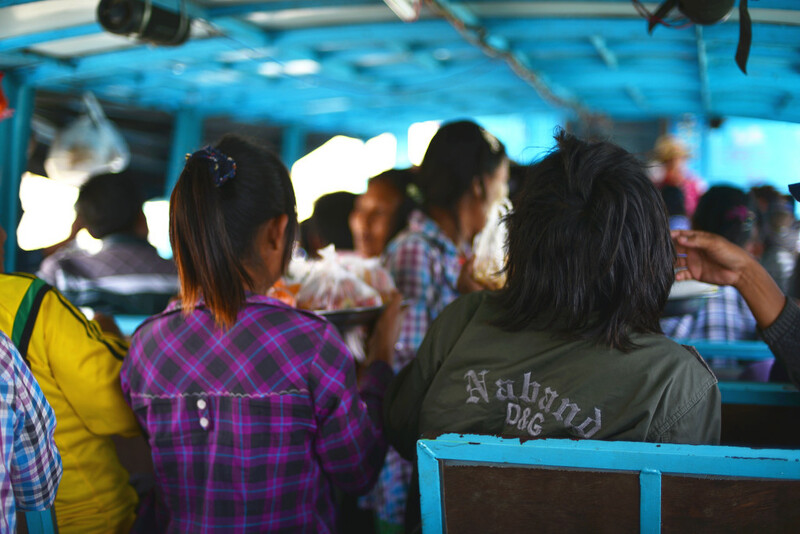 Even the couples with children are quiet, speaking little, a few of the passengers making regular walking rounds around the boat’s exterior ledge, an easy route to the exterior toilets mounted to the back of the boat. The smaller Burmese effortlessly swinging between the windows or over the seats, the wrapped lungyis never risking unfurling at the wrong moment. No one seems particularly worried about falling into the water during the continuous acrobatic transit between the interior of the boat, the exterior ledge passage and the roof top, just as people agilely hop in and out of the smaller transit longboats, easily positioning themselves so that the boats don’t risk tipping over. 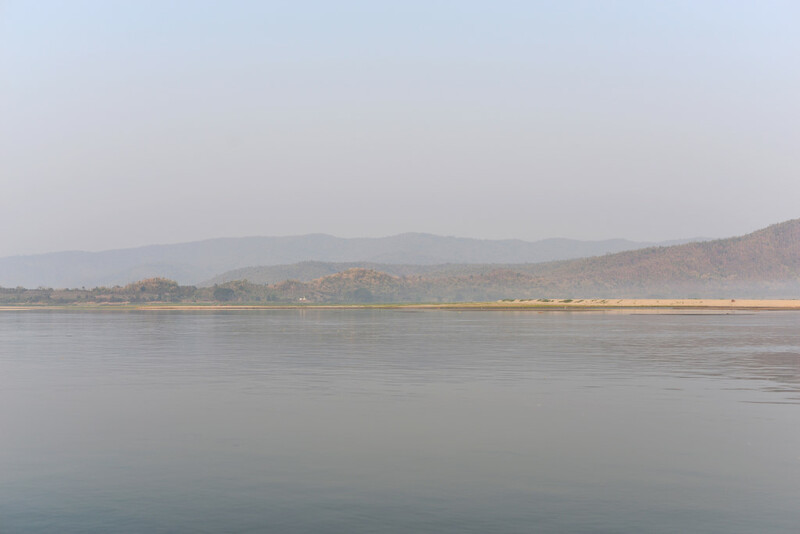 Then again, the river is mostly relatively docile on the surface – as broad as the river may be, we are definitely not on open water. It is barely late morning, and I feel as if the day has dragged on forever. 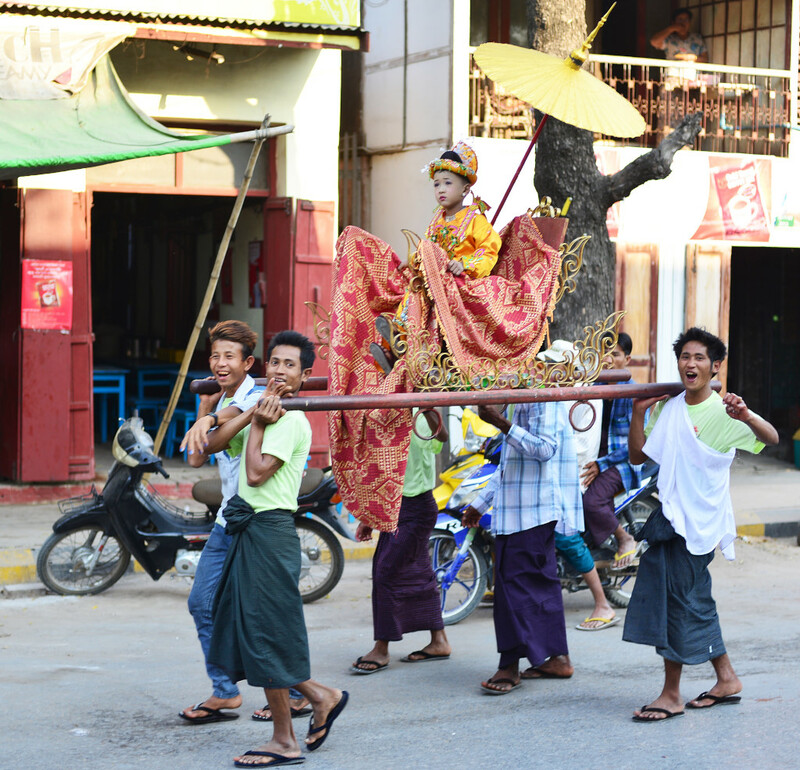 I am debating what to do in my last days here in Myanmar. It seems I just got here, and now have to leave already. Up to now I have been taking every day at a time, not thinking about the exact schedule I should be following, but now is apparent that I need to think this through. 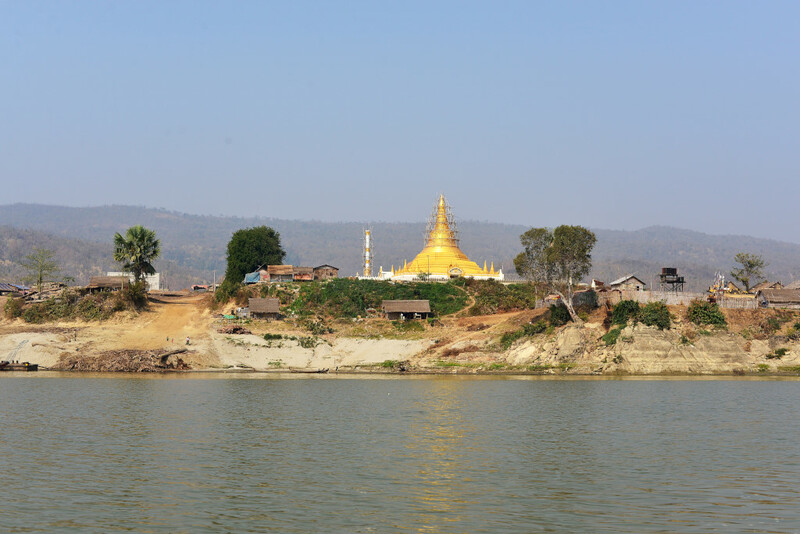 I should spend a few days in Shwebo, two to four days in the Monywa area to explore the Chindwin province, a few days in Bagan, and then finally back to Yangon for a few days, but even that relatively abbreviated schedule may be unrealistic. I struggle with my onward plans, unsure as to whether I should spend the next month traveling in eastern Thailand or head south to Malaysia, then top off the few things I did not see in peninsular Malaysia before continuing to Sabah. 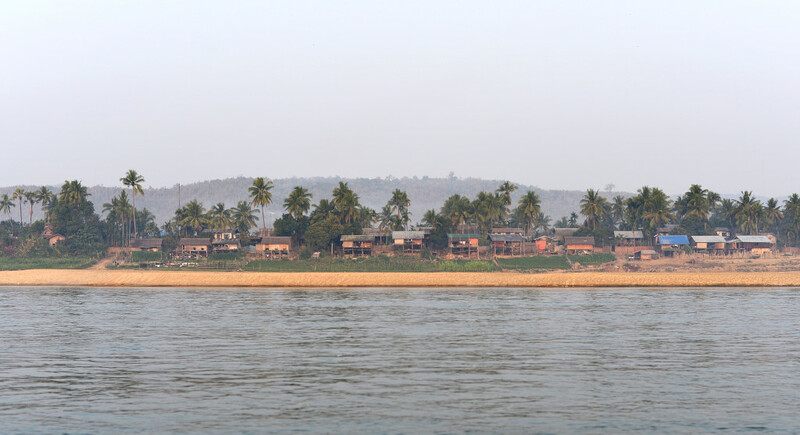 We approach a promontory lined with a continuous row of raised teak shacks, beyond which lies a small cove where boats berth. We are approached by a smaller longboat with portable kitchen installed, the man seated at the stern barking instructions to his daughters clambering like monkeys through the ferry, taking orders from ambivalent passengers, the mother seated behind the collection of pots heaving rice into Styrofoam containers, followed by the meat curry, the stewed vegetables, and other condiments that comprise the obligatory Burmese meal. Time is of essence, as they have to sell as much food as possible before the boat pulls out again, never mind compete with the individual female vendors balancing shallow baskets on their heads laden with mandarins, bananas and applies, packages of snacks, samosas, steamed cob corn, skewered steamed sweet potatoes, grilled chicken and surimi cuts as they push their way through the melee. Feral young boys with faces done up in chalk patterns aggressively push drinks from their ice-filled buckets, momentarily stopping to look at me inquisitively and bursting out laughing when I make a face. 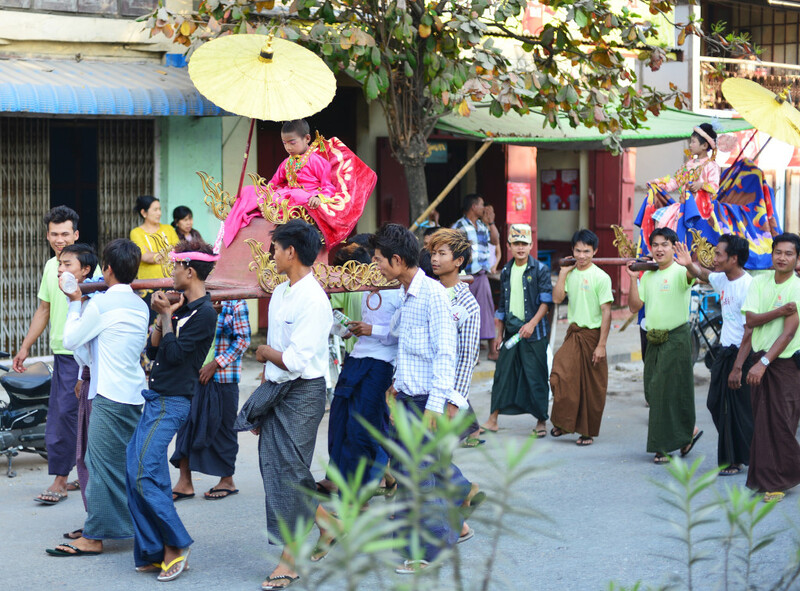 Amidst the melee of food vendors, two men in street clothing weave through the crowd, one tapping on a gong that resonates loudly through the boat, and the one in front of him holding a bowl, presumably raising money for some local temple. The last women rush to the ledge of the boat as it begins moving away from the shore, with practiced agility jumping onto the adjoining boat, then the shore, the baskets resting on their thick hair buns never slipping from their place. 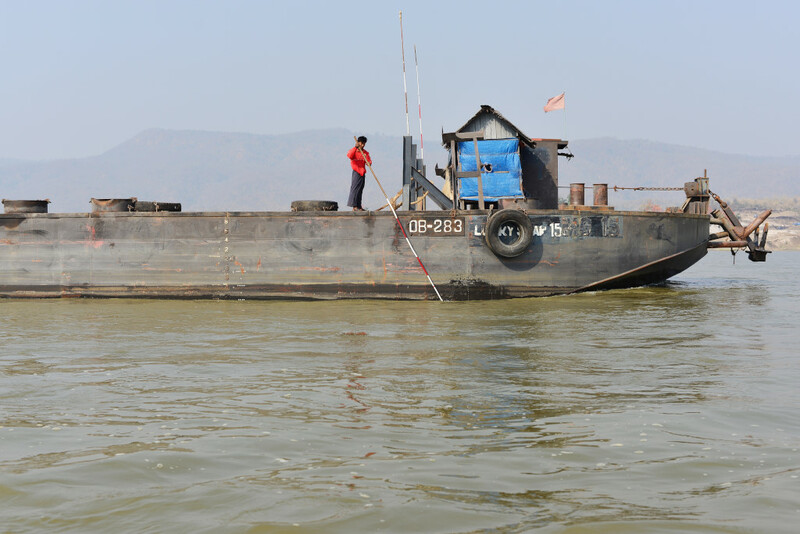 But our boat never goes far, slowly nudging next to the much larger barge, a number of motorcycles offloaded from the back onto the barge, which several young men stride purposefully toward to take possession of. 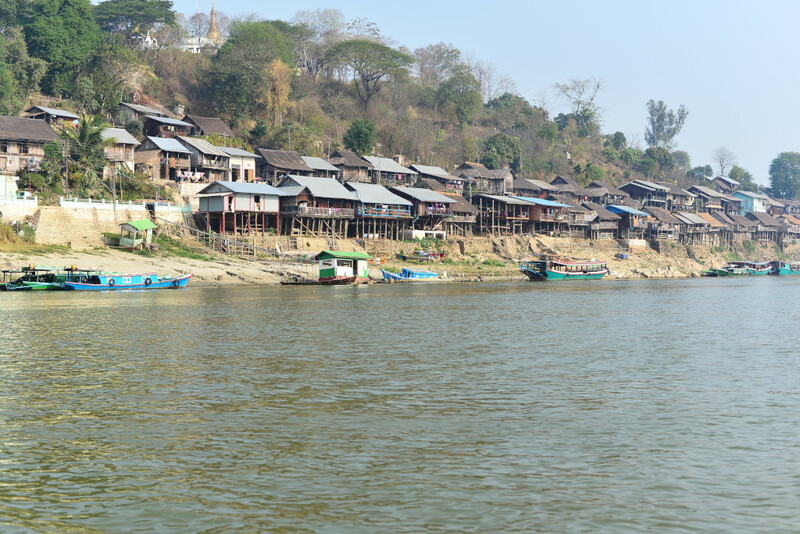 Gigantic bundles of long bamboo poles are roped together and floated slowly down the river, sized on occasion to the point of becoming independent floating colonies, the presence of women visible from the typical shallow conical hats preferred by locals, the face chalk much more evident on women’s faces than men’s. 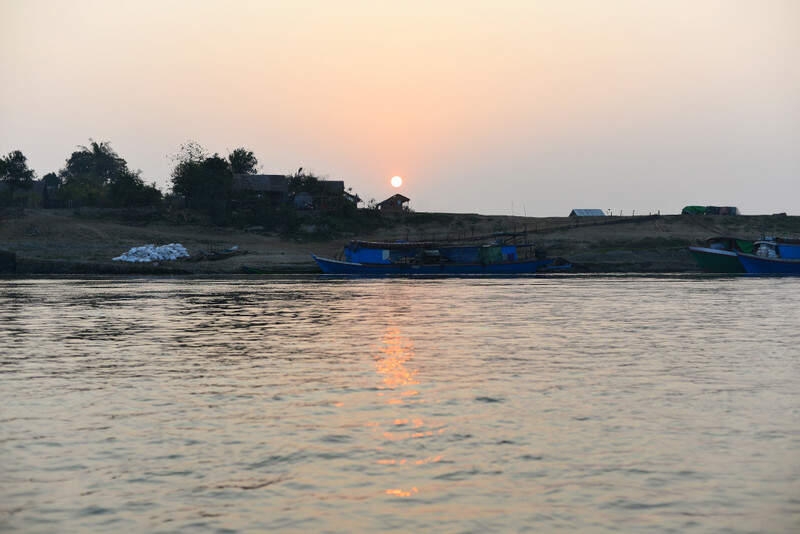 Beyond the occasional buffalo chewing its cud methodically along the cliffs, and the occasional flock of birds passing by in formation, no wildlife is visible, certainly no fish jumping in the water or better yet, Irrawaddy dolphins, probably close to extinction. 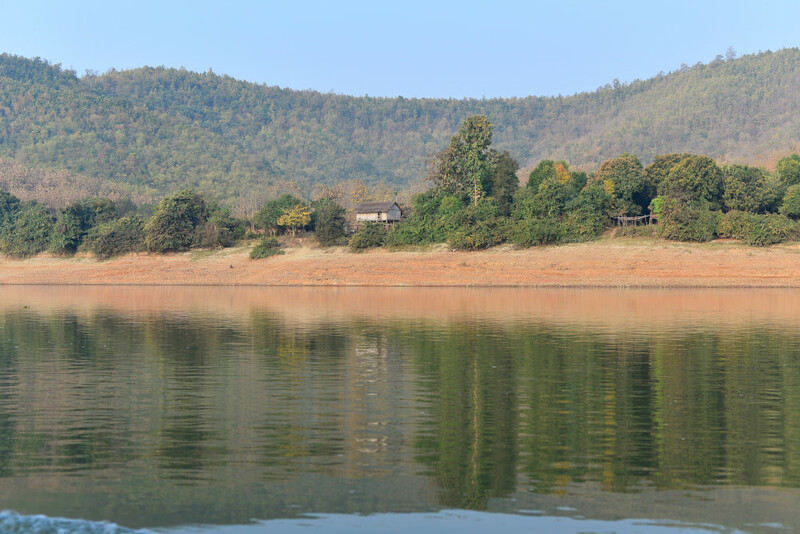 The shoreline reflects in the water like a mirror in the more quiet sections of the river, although we come into a passage later on the trip with significant wave action, the waves running northward against the current. Large commercial vessels pass us with some frequency, loaded to capacity with identical sacks of goods, destined for some distant inland port upriver. 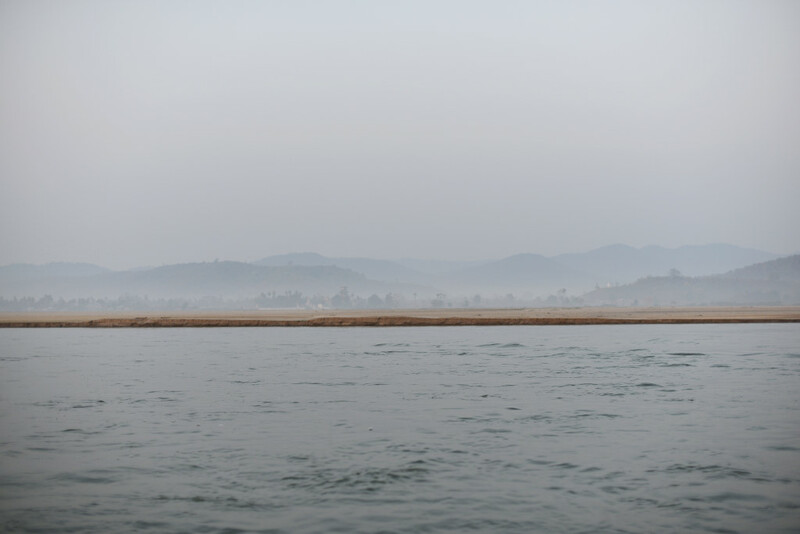 On occasion, waves are exchanged between boats, but mostly we pass silently, men standing on the bow of the boat, probing the depth of the water regularly with long poles, although it would seem to me somewhat academic if there is a sudden jump in the height of the bottom. The pilots are probably familiar enough with the waters to know when to cross the river for no apparent reason, seemingly inexplicably hugging the shoreline for a while, crossing mid river, and then locating some minor channel amidst the sandbanks and eddies. 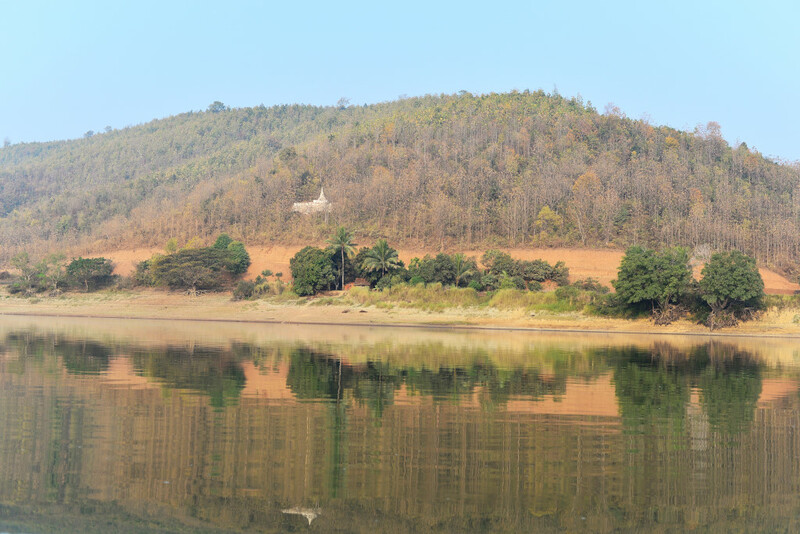 Unlike the relative convoluted upriver passage between Katha and Bhamo, the river is generally wider and deeper, allowing us to proceed downstream at a reasonable velocity. In flood, this river must be absolutely immense. One typical sight along the shoreline is that of women washing clothing, usually beating the tightly wound wet and soapy clothing with a club, although surprisingly, men are sometimes busy doing the same work. 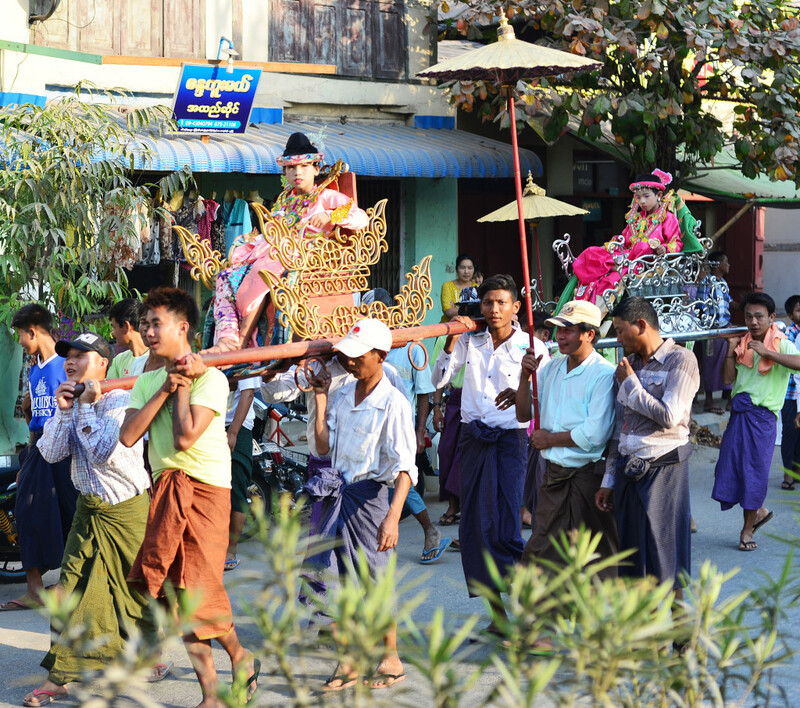 The Burmese are hardly a patriarchal society, but still, people adhere to naturally appointed roles, men commanding roles that require more physical prowess, and women taking care of domestic affairs and the children. 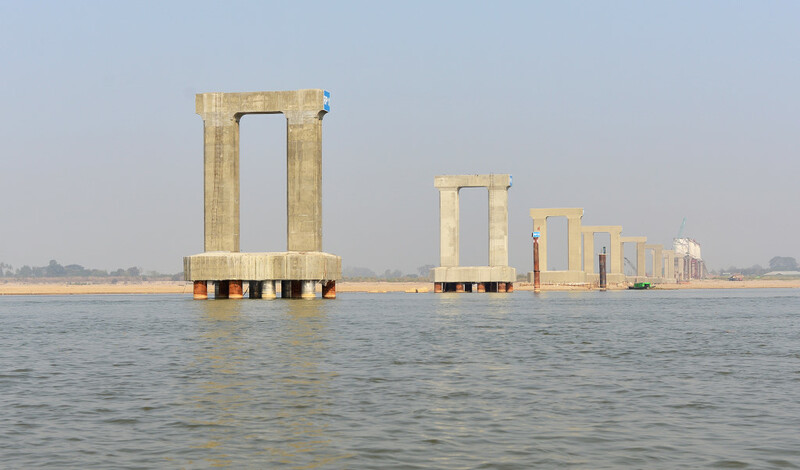 Midway, we come across the beginnings of a large bridge being built on the river, nothing but the large concrete pylons in place. The stark earth tone and deep greens of the passing landscape are interrupted on occasion by the brilliant orange swath painted across the trumpet flower trees along the waterfront. 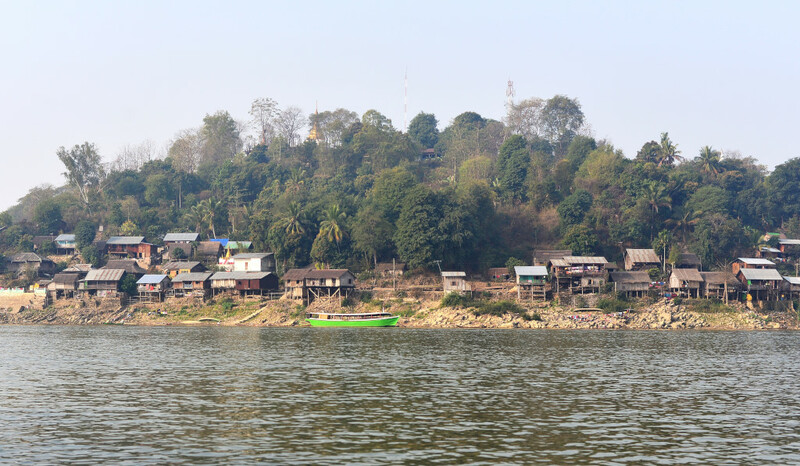 We approach the shoreline studded with a forest of golden stupas, a smaller longboat approaching the ferry, the boatman pulling it snugly against the larger vessel, and many passengers from the larger vessel clambering briskly into the smaller one. 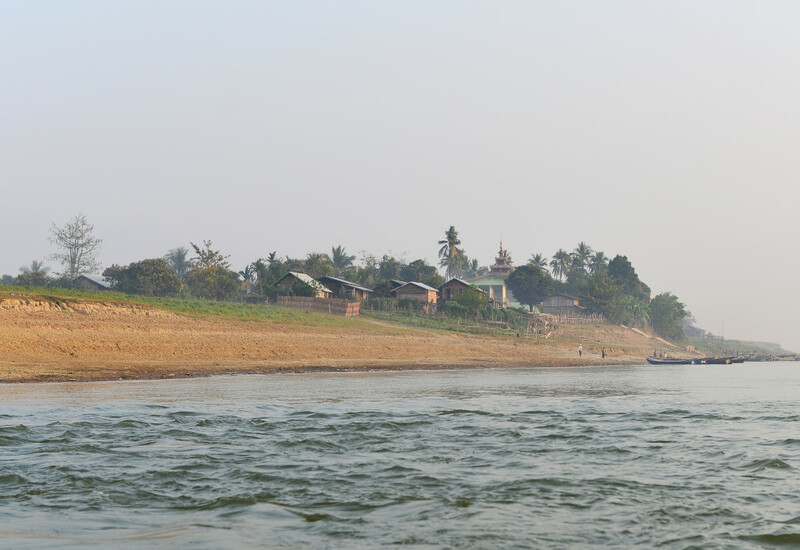 One of our boatmen makes his way forward along the ledge of the ferry, peering inside, calling the name of the port, and only when he reaches my vicinity do I make out Kyaukmyaungn (“chow-myow”). I heave my daypack in his direction, and rush forward towards the bow to pick up my larger pack, and then it is overboard also. 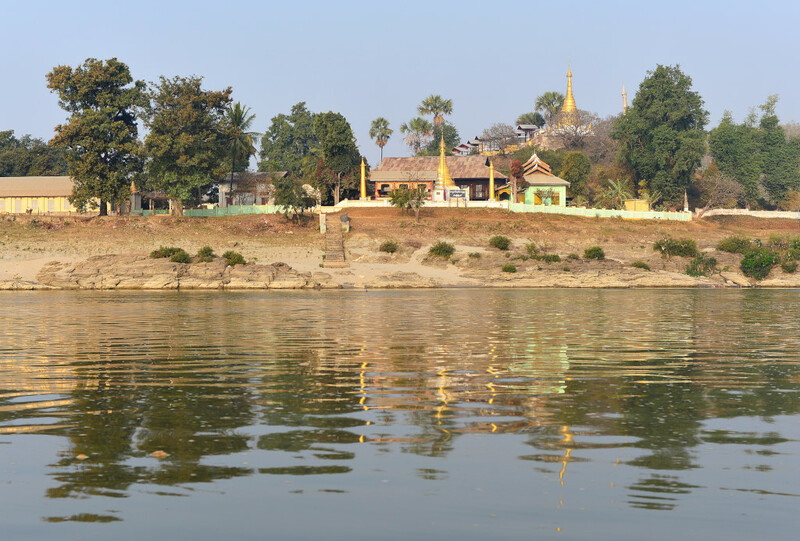 I jump overboard myself, and as we putter towards the shore, I turn around, and already the larger ferry has disappeared under the distant bridge in the direction of Mandalay, several hours further downstream. We land, and the group dissipates, leaving myself in addition to the two men who boarded earlier, whose provenance seemed somewhat unclear, one man wearing western clothes and baseball cap, fidgeting with his cell phone, and his smaller friend with long hair and slightly ragged appearance, his teeth rotten and heavily stained in betel juice. 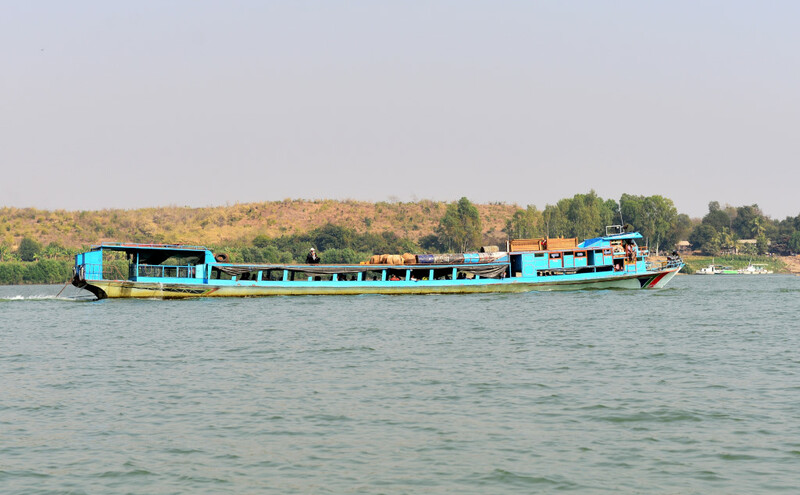 They are also heading in the direction of Shwebo, the taller one taking the initiative to negotiate with the pickup driver for an appropriate fare to Shwebo, but given the requested price, we balk. The driver suggests we can walk to the town gate, from where the collective pickups leave. 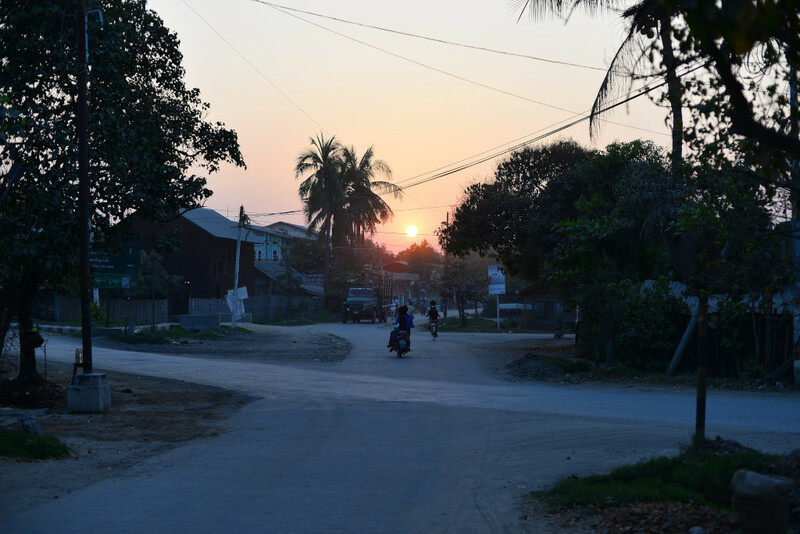 Walking through Kyaukmyaung, the village appears humble but very pretty, although it is possibly due to the manner in which the golden light shimmers on the dark stained teak in the late afternoon. 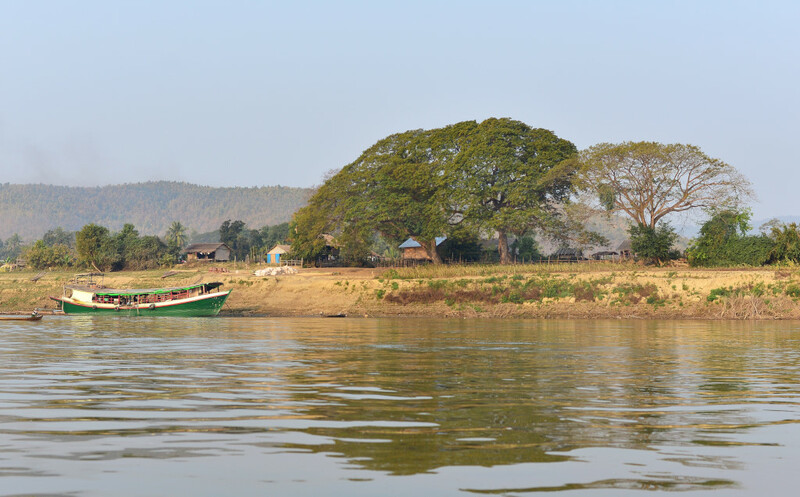 At the gate, we are confronted by more pickup drivers, who try to pry as much money out of us as possible, starting at 15,000 kyat for the lot of us to go to Shwebo, then just 8,000 for me, and finally they get bargained down to 10,000 for the lot of us to drive the hour to Shwebo. One of the men in our group shows me his cell phone, the back covered with a banner of the National League of Democracy, followed by his cell phone splash screen, featuring the Lady in an elegant outfit and veiled hat, looking absolutely stunning. He asks me if I know who she is, to which I respond ‘Aung San Suu Kyi is the Nelson Mandela of Asia, probably one of the most respected women in the world right now.’ He asks me if I believe in democracy. Again, what kind of a question is that. But democracy does not guarantee a standard of living, health care, work, the things that people deem important, so rather than just achieving democracy, you are burdened with the pressure of having to accomplish concrete socioeconomic gains, and every failing will be pinned on you. The pickup now drives off with myself and the other passenger coming from Kyaukmyaung, who conveniently paid nothing for the trip. We pass by a long procession of women clothed in colourful sequined gowns, followed by costumed people riding small brilliant chariots. 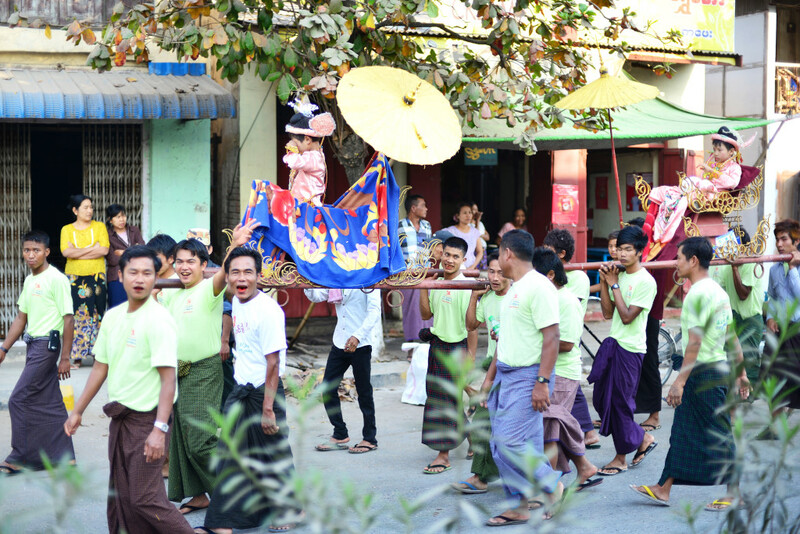 Shortly thereupon a much smaller procession of young men carrying several children on elaborately gilt and decorated sedan chairs passes by, the children looking out of sorts in their elaborate finery. The town itself is far more modern than what I have seen to the north, at least along the central roads leading into town, in some way a relief, but otherwise also lacking in fundamental character. Looking at the buses passing us, I think it will be nice to actually take the bus as a transit option, which is not possible in the north of the country. We pass a diversity of businesses, retail, cellular phone services, automotive shops, restaurants and beer stations, a few banks, traffic, nothing particularly out of the ordinary, the pickup dying an untimely death as our cohort disembarks and the driver can now no longer start the vehicle. We have actually been driving for some time through the town, which would suggest that the town is either very large or the hotel is located in the middle of nowhere. Several other drivers assist in pushing the vehicle and we are off again, shortly thereupon arriving at the Win hotel. The hotel is relatively characterless, with three floors, although the public areas are clean and airy, the large windows lit up by the endless sun shining outdoors. I decide that the air-conditioned room with private bathroom on the third floor, with clean and functional beds, new fridge, modern lighting, impeccable mouldings on the ceiling – although offset by the utterly dilapidated bathroom – is definitely acceptable for the $20 price tag. I would really prefer that there be wifi, as visiting the nearby internet cafe will just unnecessarily take more of my time – but there is no other choice. I flip one light switch, then another, to no avail. Some more switches, and still nothing. Downstairs the staff at the reception busily begins playing with the breakers, but when I return upstairs, there is still no electricity. I decide to descend with my packs and tell them I will come back when they have sorted out the electricity problem – this is just frustrating and for the rate they are charging they should be doing a better job. My thought is actually to see if there is another hotel option in town. Given this town seems fairly modern and moneyed, and it would make sense that there would be some competition. I walk northwards on Aung Zeya street but spot no hotel or guesthouse, finally sitting down in a cafe to order a coffee and water to combat my low energy and dehydration. From the point of reference of this busy main artery, I can see that the side streets are far less opulent, mostly just home to sprawling dusty bungalows, smaller workshops and at best modest retail. Astonishingly, two young men laughingly hand out fliers for a cellular company, accompanied by the syncopations of Cuban percussion, a massive shot of adrenalin in this musically recalcitrant culture. I try to not look in any particular direction while ambling along the street, but have automatically become a huge attraction, virtually everyone I even look in the direction of staring at me. In the café, the young workers look at me with a combination of amazement and admiration. This may be good for the ego, but I am really tired and feel the experience verges on ridiculous. I don’t see what is so interesting to look at, although on the other hand, I myself never get tired of looking at people here. I weave into the side roads radiating from the main north-south corridor, but I seem to be getting lost quickly, given the rudimentary nature of the Lonely Planet guide’s map. The increasingly residential area lacks any kind of memorable qualities, and as friendly as locals I pass are, the few I ask as to the location of the palace have absolutely no idea what I am talking about, waving me any which way. Temples abound, none of which are marked on the travel guide. Packs of dogs lie by the side of the street, emerging from the temple properties to launch themselves in my direction, barking ferociously, which they quickly regret. The orange disk of the sun sinks above the dusty road as I approach the vicinity of the palace walls, the terracotta and gold of the typical Burmese tiered pagodas looming through the greenery, the circumambulating road passing along the periphery of the palace, an initial foray into the grounds amongst the dogs roused to action, then back onto the road weaving through the residential area, twisting and turning, locals looking at me in astonishment as I amble through, camera in one hand and book in the other, eventually rejoining what I think is the main road, but now I really have no idea as to where I am. 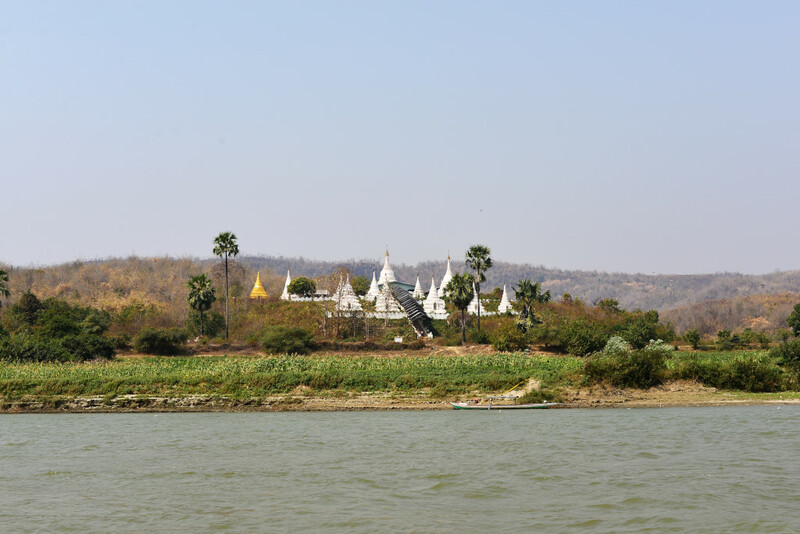 On my left, another set of golden stupas located to the back of an empty lot – or perhaps the same ones I passed before, as they really are all the same, studiously ignoring the ‘hey’, ‘hello’, and ‘minglabar’ being yelled in my direction, earshot being happily invariably lost within a few long strides? The expansive terrace of a local brightly cafe beckons, as it may offer the possibility of a good coffee, if not now, then later. Wandering towards the back, the signage is only in Burmese, and despite the somewhat orderly propriety of the front of house, the large kitchen area behind the rear dividing wall is much more rustic, with no modern-looking equipment of any sort in sight. Eyes are upon me as I stride to the back, and now all the workers are beaming at me as I enter the back. I am intercepted on the way out by a tall, relatively stocky local who tells me he is a taxi driver and tour guide, and would be happy to help me, the kind of language that would in another country result in being categorically ignored. Interestingly, I was intercepted by touts on a number of occasions on my first trip to the country almost 20 years ago, although I was a fairly unwashed traveler at that point. Myanmar is just so removed from the kind of hustling you can experience in other countries it is surprising to meet any such individual nowadays, not to criticize his intentions. 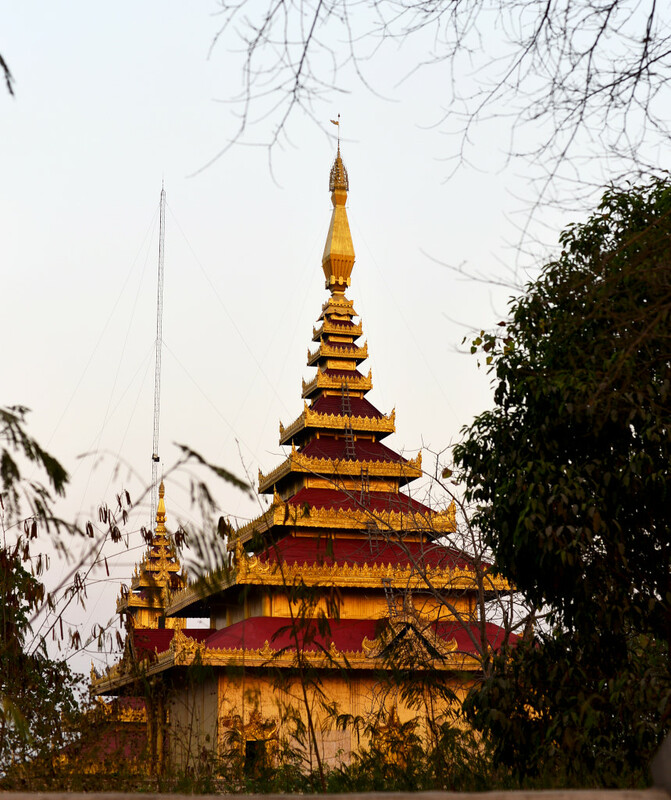 And then there is precious little to see around here, other than the few standard pagodas nearby and the royal palace compound which the travel guide speaks of dismissively. Nearby, Hanlin is a largely decayed archaeological site with apparently little to see, the adjacent village apparently very atmospheric, but the entire lot accessible over a lengthy, circuitous and terribly maintained road, pretty much requiring a dedicated taxi driver, which would mean another round of aggressive negotiation, which I couldn’t be bothered with. The taxi driver points me to a young American seated at a table towards the front, hunched over his diary, writing intently. 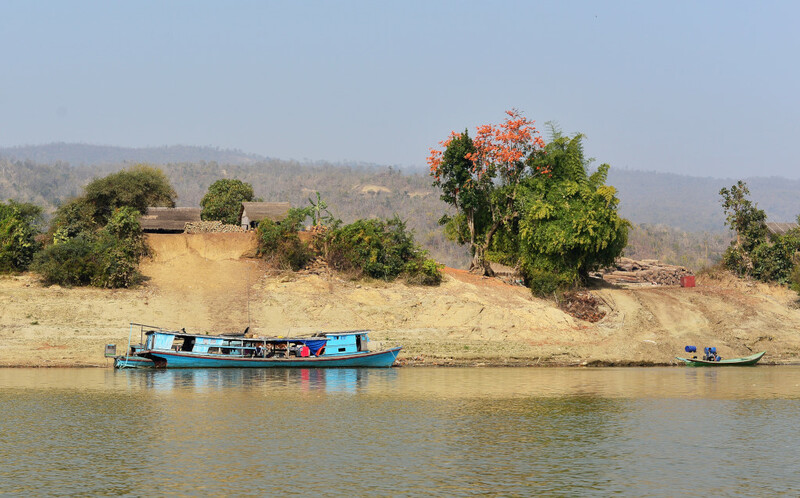 He has broad plans for seeing remote areas in northern Myanmar, but beyond the fact of physically not being allowed to go, he doesn’t really have that much travel time to begin with, and is being somewhat unrealistic as far as spending his time is concerned. I am of course the most organized person possible when it comes to arranging my trips! Ironically, even on a lengthy trip through a region, one may be limited by relatively short visas in a particular country, which means having to maximize the amount of things you can see and do in that relatively short period. I provide him with all the details I have garnered from traveling to the area myself, the subject a point of departure to the nature of traveling itself, the attractions we have taken in throughout the region, and the challenges and trade offs of traveling in general. The time unravels and I stay far later than originally intended, probably too tired to want to do anything else this evening in any case. Joe is originally from a farm in Iowa, not the best place to be from, he concedes, although he comes across as an utterly honest, kind and sincere person, precisely the kind of the person I would expect to meet in the depths of the Midwest. ‘But most of us are intolerant closed-minded rednecks – don’t romanticize the place I come from!’ he admonishes me. He now lives in what could only be considered the cardinal opposite of where he grew up, and that is in the bowels of Los Angeles in a very ethnic Asian enclave. While you have to know the diverse parts of Los Angeles to appreciate what they have to offer and you can’t get around with public transport, the city is a hub of diversity and culture in a way that few others are in America. As much as he would not imagine living in a poor area of central Los Angeles much longer, he asks himself where he would move to after this. He loved Vietnam, and it seems to have been the highlight of his trip. 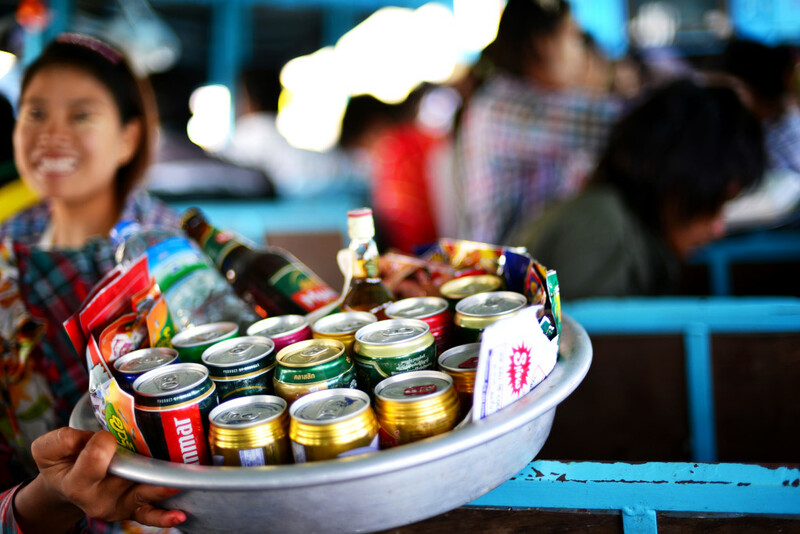 Dealing with taxi and tuktuk drivers is a huge problem, as they are constantly hustling and cheating, but that is fairly standard in Southeast Asia (outside of Myanmar, Thailand and Malaysia). He was somewhat underwhelmed by Angkor Wat, as he subconsciously compared it to Tikal which he saw on a backpacking trip to Guatemala with his father when he was 15. I concede that the physical architecture and location of Tikal is stunning, but then Guatemala overall is one of the most amazing places I have ever visited, and thinking of how Myanmar has become more of a pedestrian reality upon revisiting, how Guatemala would suffer in a similar situation. We celebrate the subjective when traveling and hence can’t return and expect the same experience. One thing about Southeast Asia – the natural environment is in sharp decline everywhere, or the countries not set up to allow the easy exploration of whatever little there still is to see. I imagine that Vietnam must be one of the best countries for food. 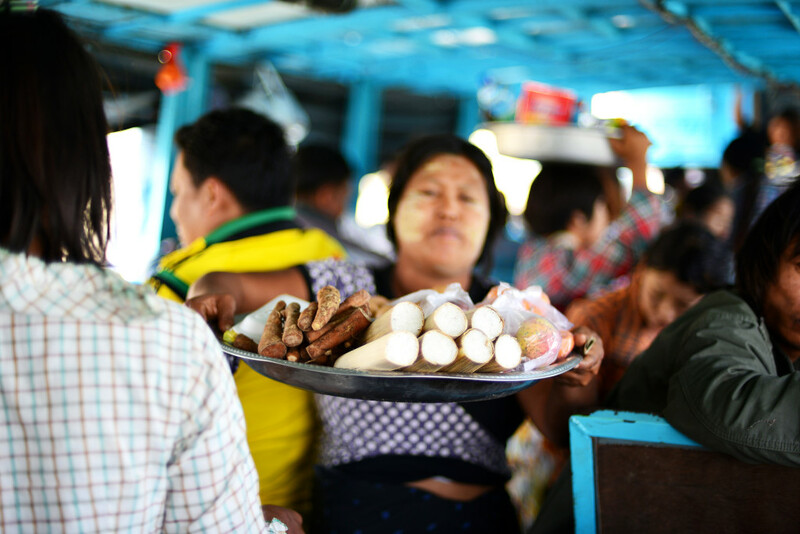 We agree that Laos is one of the worst countries around for food, given the predilection for insects and fish paste. 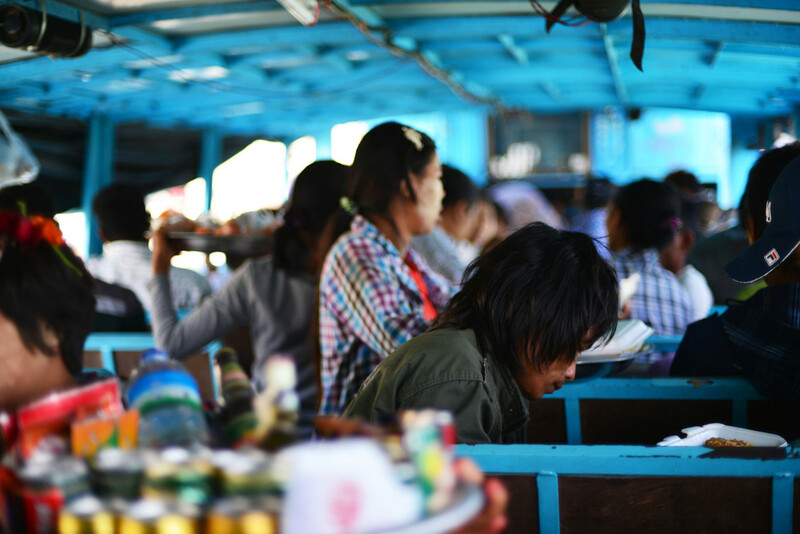 I experienced stellar moments in Cambodia, but actually find Thailand underwhelming, much of the food mediocre and bland. 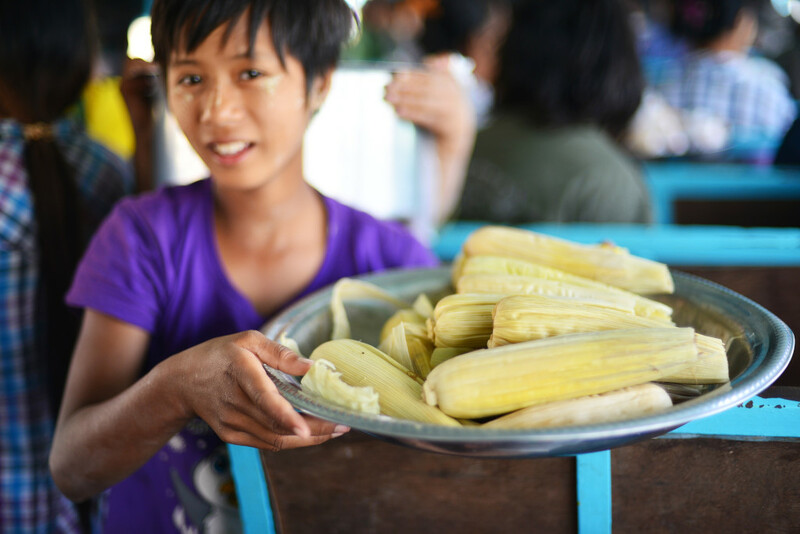 And as hard as I find myself saying so, much of the food I have had in Burma has been very good if not amazing – as long as it contains no fish paste! Malaysian food is a complicated subject, with so many different cuisines living in parallel, with the utterly mundane living alongside the brilliant.